Nutriceuticals from olive pomace; EVOO-powered vaporettos; Last day to enter AIOA – do it NOW! New uses and benefits of olive pomace paste are explored in NUDACE, a Spanish research project that focuses on the obtention of nutraceuticals and functional ingredients from olives, with a view to helping fight degenerative processes associated to aging. Interested? Find out more in the three-part Australian R&D report on the topic in the March, June and September 2017 editions of Olivegrower & Processor. 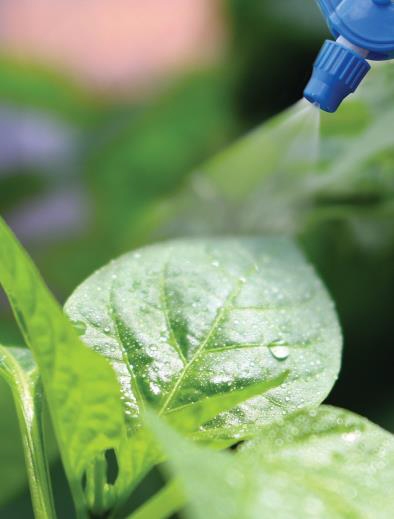 Smart spray: BioClay is a non-toxic crop spray. Cotton and vegies now but sounds promising for other crops too. French organisation Odyssée Agri arranges work experience placements abroad for young agricultural professionnals. Among the current applicants is Belgian Margot Renier, who is looking for a placement through to September 2019 and is interested in bee-keeping, market gardening and fruit production. Margot has a Masters degree in agricultural engineering (plant production and protection), speaks good English and is keen to find out more about agronomy in practice. Find out more about Odyssée Agri here or contact Jean-Marie Poirier at jmpoirier@wanadoo.fr for more information. Got something to sell? Or want to buy? Go direct to your target market – like Peter, whose auction of olive equipment is on tomorrow. Submissions and feedback are now open for a new National Biosecurity Statement that will provide a common and unified approach to biosecurity. As frontline stakeholders, your input will assist in the successful development of the statement content. Submissions close 31 October. View the draft document here and access more information and submission forms here. Peter Bird at the Vineyard Office and sign in point. 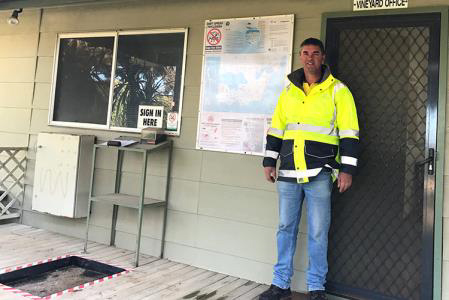 Recently when asked what the big issue in biosecurity is Peter Bird at the Vineyard Office and sign in point, Casella’s South Australian Vineyard Manager Peter Bird paused, then reluctantly responded: grower apathy. “And I include myself in that!” says Peter, who oversees 3,800 hectares of Casella vines across every SA wine region as well as 90 hectares of his own vines in Wrattonbully. This wine industry information is just as relevant to olive groves, as is the reference list of the top 10 farm-gate hygiene activities every grower should implement. 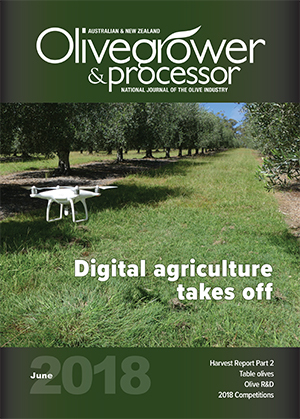 Your subscription to Australian & New Zealand Olivegrower & Processor provides the latest industry news, R&D and practical grove information straight to your letterbox. If you’ve received a renewal notice and haven’t gotten around to paying it, now’s the time to act to ensure you don’t miss out! Are you a young person 18-30 with a passion for agriculture? A forward thinker, who could be the voice of the future? Applications are now open for the evokeAG Future Young Leaders Program, which will take 10 emerging thought leaders within the agriculture and food industries in Australia and New Zealand to the inaugural international agrifood technology event, evokeAG on 19-20 February 2019 in Melbourne. Applications are via a short video on: ‘Why should you be selected as a voice of the future at evokeAG?’ and winners will receive a five-minute presentation opportunity at the event, as well entry and attendance expenses. Applications are now open and close on Friday, 12 October, with winners announced on 19 November. Full details and applications here. WA’s Value Add Agribusiness Investment Attraction Fund makes grants of up to $300K available towards capital expenditure by businesses that invest in expansion, relocation or new value-adding production. Additional grants of up to $100K support agrifood businesses undertake feasibility studies and business plans, obtain regulatory approvals and engage other services required to support an investment decision to expand, relocate or establish production facilities in WA. Deadline for applications is 19 October. More information here. Spanish, Italian, Chinese, New Zealand, Australian … yours? 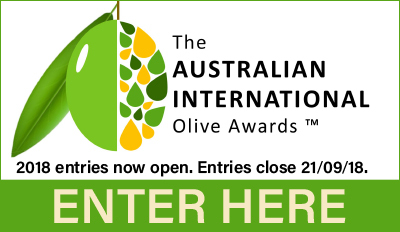 Entries close today for the 2018 Australian International Olive Awards – SA producers, do it NOW! Entries for the 2018 Australian International Olive Awards close today, along with the chance to be named Champion EVOO and/or Table Olive of Show. 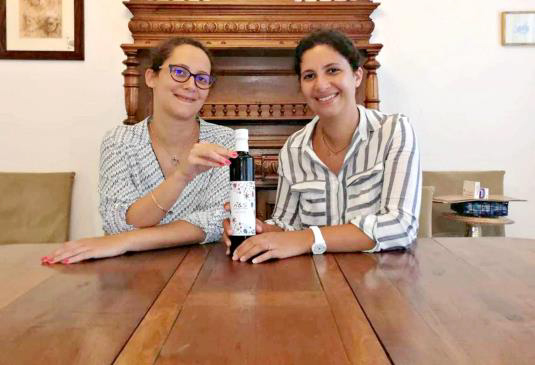 Now in its second year with international status, the competition provides the opportunity for producers to showcase their winning EVOO and table olives to the world - and reap the marketing benefits. The competition is fast gaining status internationally and this year has seen a vast increase in the number of international entries, coming from Spain, Italy, China and New Zealand. Entries close at COB today, so producers close to Adelaide still have the afternoon to get theirs delivered. 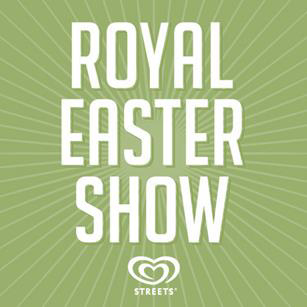 Download entry forms here, and touch base with Chief Steward Trudie Michels to let her know they’re coming - tmichels@globaldial.com. 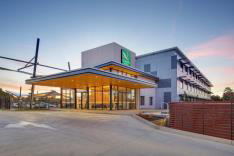 And don’t miss the big announcement of winners at the Awards Presentation Dinner on 19 October at Wagga Wagga, being held in conjunction with the 2018 National Olive Industry Conference & Exhibition. Book your tickets here. Discussion is an important part of learning and problem solving, and that’s why Q&A sessions and grove walks are an integral part of the 2018 AOA National Olive Industry Conference & Exhibition. The packed program of plenary and field sessions aims to provide information and skills on a broad range of topics, with valuable practical take-homes for all participants. To that end, opportunities for both group and individual discussions with industry experts have been included across the three-day program. Bring your questions, grove issues – and experience – and be part of the knowledge sharing! Innovations to revolutionise how we produce food will be on display at a free major event, the Global Forum for Innovations in Agriculture, 27-28 November at the Brisbane Convention & Exhibition Centre. Access innovations to: increase yields; manage energy use; improve nutritional value; go organic; improve soil health; prepare for climate change; save water; control pests; reduce food losses; automate inputs and use ICT effectively. More information and register here. It’s now just two weeks until entries close for entries into the 2018 Hunter Olive Show. This includes all categories – oils, table olives and tapanades Entries are due by Friday, 5 October and winners will be announced at the presentation celebrations on Thursday, 15 November at Adina Vineyard & Olive Grove, Lovedale (TBC). More information, entry forms and details of how to enter can be found on the HOA website or contact Chief Steward Alan Smith at treasurer@hunterolives.asn.au or 0419 255 949. Olives NZ’s annual collection of harvest data is underway ready for preparation of the annual Harvest Data Report. Report data is provided annually to various external agencies, some international, and was included in the presentation given by the IOC to MPI/MFAT on their visit to New Zealand in May. The data is also included in the annual Flos Olei publication from Italy. The data provides useful cross-industry information for growers, while the individual updated Grove Report assists in monitoring the performance of trees on an annual basis and also comparatively against the regional and national averages. Growers are asked to complete and return 2018 harvest data forms as soon as possible, as the regional data will be included in the Focus Grove Presentation at the Olives NZ Conference on 13 October. Applications for Certification of NZ oils are now closed, with retained samples heading off into storage for two years. EO Gayle Sheridan said 85 Olives NZ members submitted 184 samples for Certification, representing more than 152,000 litres of oil produced. “This season has seen an increase in mild PPs - in fact mild at 50% equals the total of medium at 39% and intense at 11%. Typically there is a fairly even spread across the intensities. Kapiti Olives Koroneiki EVOO took home the Supreme Award in the 2018 Royal Easter Show Olive Oil Awards. The consumer-focussed competition awarded 12 Gold, 17 Silver and 4 Bronze Medals for what judges described as a very high standard of oils, with close competition among the top twenty entries. Gold Medals went to: Kapiti Olives, Kapiti Coast (Supreme Champion); Rock Bottom Grove, Wairarapa; Rangihoua Estate, Waiheke Island; Cable Bay Wines, Waiheke Island; Cove Olives, Northland; Flaxbourne Olive Oil, Marlborough; Koru Olives, Northland; Man O War, Waiheke Island; Number 29, Waiheke Island (three entered, three Gold); Rangihoua Estate, Waiheke Island. A great solution for using out of date or faulty olive oil. Let’s hope the trial is successful. Women are making their mark on Tunisia's fast-growing olive oil industry, even if it's often behind the scenes. The conference will gather industry members from an array of disciplines to plan the formation of an olive oil think tank. (Jordan): Prime Minister Omar Razzaz’s recent remarks on the school students’ participation in the coming olive harvest season was warmly welcomed by parents and stakeholders, hailed as a useful occupation for local youth. While some citizens expressed scepticism over the idea on social media platforms, many commended the initiative which they said would employ the youth’s energy in something useful “instead of hanging out in the streets doing nothing”. 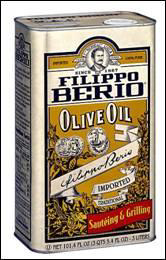 Flippo Berio olive oil no longer proclaims “Imported From Italy” on the labels, under the settlement of a class action. The product is shipped from Italy but is not comprised of oil pressed in that nation. The Ninth US Circuit Court of Appeals yesterday rejected a class member’s challenge to the settlement of an action under which purchasers of Flippo Berio olive oil - which proclaimed on their labels, “Imported From Italy” - will receive, subject to provisos, 50 cents for every bottle they purchased between May 23, 2010 and June 30, 2015.